Dog vomit and dog ownership go together like peas and carrots, but still you may ask, Why is my dog throwing up? How can I prevent it? Do I need to take my dog to the vet? 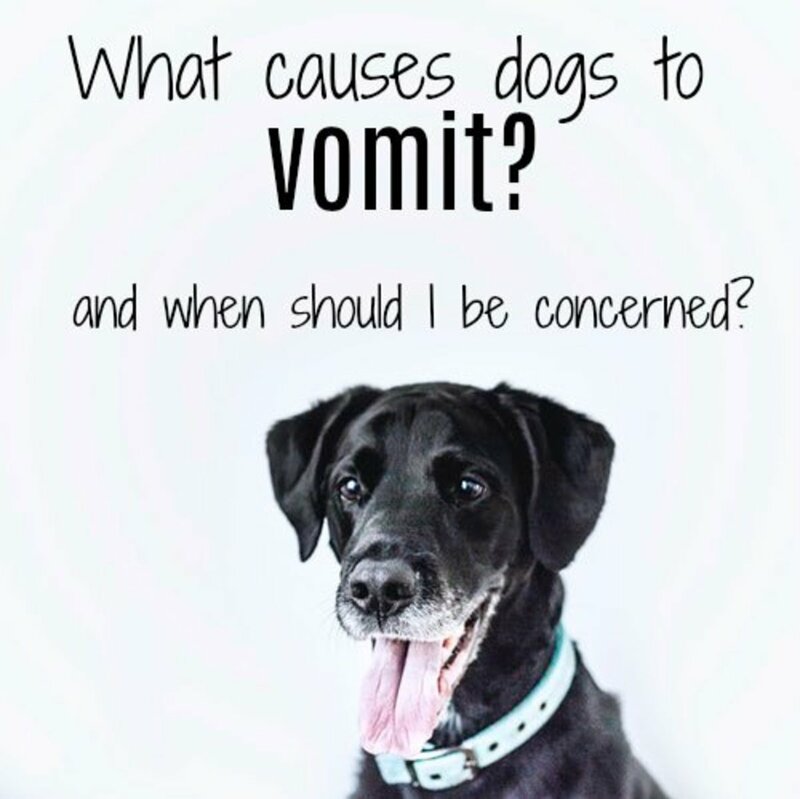 In this article, I will discuss some of the common causes of vomiting in dogs, what you can do about it, and when you should be concerned about more serious conditions. I'll also be offering up some well-deserved levity (come on, it's DOG VOMIT) and anecdotes to make this unpleasant experience a tad more bearable. Is your dog prone to throwing up? My dog is the King of Barfs. Bow down. My dog has a spewing session from time to time. My dog was an up-chuck puppy but not so much now. Once I picked my dog up the wrong way and it puked all over the place. This one time my dog ran so hard that she barfed. My dog has never thrown up. I'm convinced it doesn't have a gag reflex. I don't own a dog. You're gross. I read online that it might be because she was going to bed with an empty stomach, so I tried giving her a little bit of kibble before bed. Of course, this only resulted in EVEN MORE dog vomit. 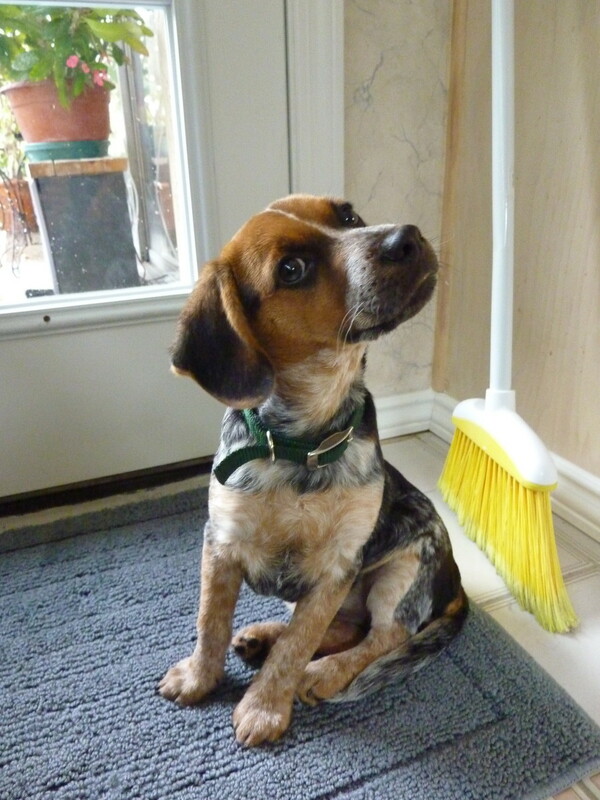 Needless to say, I had that fleeting thought of "Good God, what did I get myself in to adopting this animal?" You see, Penny is the first dog I've ever owned, and I wasn't used to this kind of thing. During those first months, I got a brief glimmer of what it must be like to have a baby. Oye. Bless you, mothers of the world. You are saints. Pet Store Worker: "Where are you storing her kibble?" Me: "In one of those plastic bin things for dog food." Pet Store Worker: "But where are you storing it?" Me: "Outside. On the side of the house." Pet Store Worker: "Is the bin ever in the sun during the day?" Pet Store Worker: "That's your problem. The oils in the kibble can go rancid. It's probably what's making your dog sick." Dumb move on my part. It turns out I was dosing my dog with rancid kibble that went bad because I stored it in the sun. It never occurred to me that dry dog food could go bad like that. So I bought one of those big bags of dog food from the pet store (because HELLO, it's cheaper) and poured it into a glorified trash can that I got from Big Lots. Store your dog's dry food in a cool, dry place. A garage is great for this, so long as it doesn't get too hot during the day. If your garage often turns into an oven, bring the food inside and store it somewhere out of the sun. If you have a smaller dog, buy a smaller bag of dry dog food. That way, the oils in the food won't go bad before you get to the bottom of the bag. Store your dog's food in an airtight container. Not only does it keep the bad stuff out, it keeps the bad smells in, and keeps the food longer. I've got a link to the exact one I use below. Clean anything that comes in contact with the dog kibble (the container it's stored in, scoops, your dog's bowl) on a regular basis, with soap and water. To avoid having to clean the big container you keep the dog's food in (which can be cumbersome and difficult), store the dog food in the bag inside the container: Cut the top of the bag off and put the whole thing inside of the storage container. The bag acts as a liner that will be thrown out every time you get a new bag of dog food. This is the exact container that I use to store my dog's kibble. 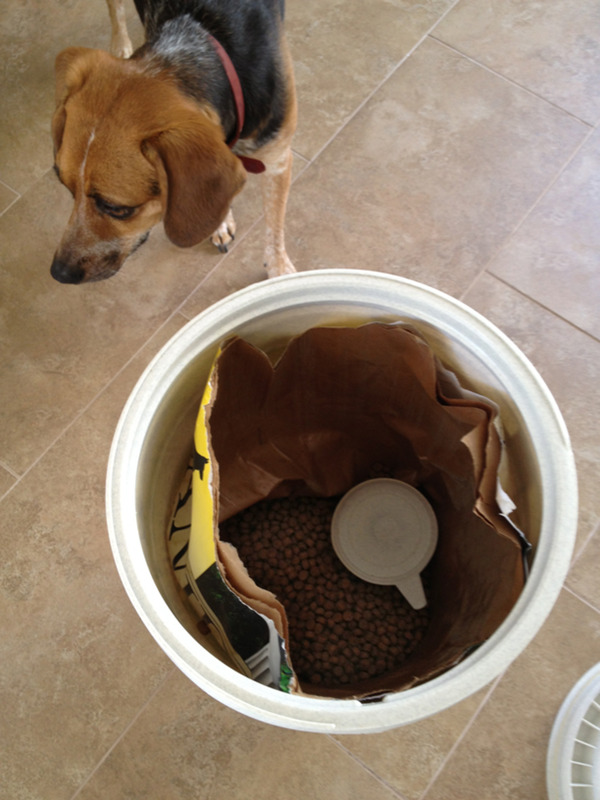 The Vittles Vault does an excellent job keeping air, moisture and bugs out of dry dog food. A 15 lb bag (with the top cut off) fits in this container perfectly. I use this guy when we travel with the dog. Since the Vittles Vault is a bit clunky, you could also keep smaller portions of kibble in one of these things and refill it each week. I recommend lining it with a trash liner and changing that out periodically – it's much easier than cleaning it with soap and water. As it is with people, there are some other illnesses, conditions, and situations that can cause vomiting in dogs. Allergies to Specific Foods — Some dogs don't tolerate certain common dog food ingredients. Your dog may be sensitive to grains, certain kinds of proteins, or additives/fillers. If you suspect this is the case, your best bet is to try a "limited ingredient" dog food (or foods with one protein source, like chicken or fish), or one that cuts out grains completely. 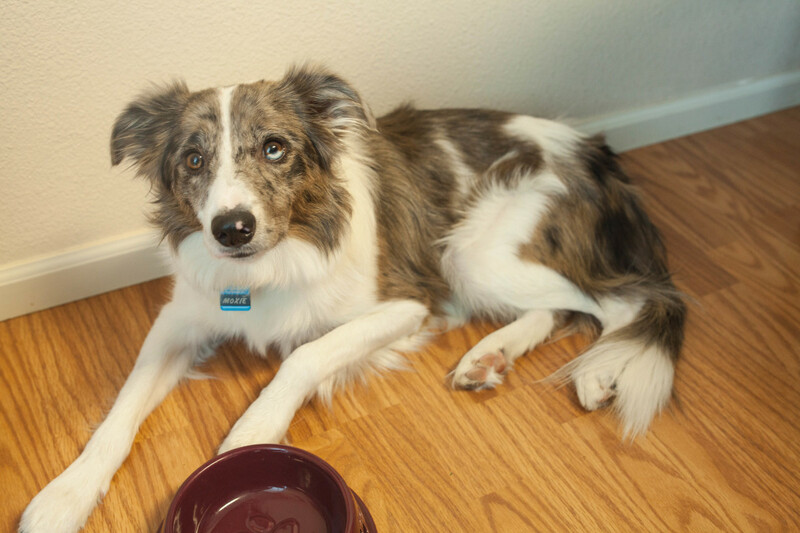 Table Scrap-itis — Feeding your dog foods that it's not used to can cause vomiting, as well. Spicy foods can cause problems on both ends (wink wink). In general, I limit the people-food that I feed my dog to relatively bland meats and non-harmful veggies or fruits. I also save these treats for special occasions and only give tiny portions. "Food Poisoning" — I probably shouldn't put "food poisoning" in quotes because it can happen to dogs the same as it does in people. If your dog eats food out of the trash, rancid kibble, or old/expired food, there is the potential for illness and vomiting. Toxic or Poisonous Foods/Items — There are certain foods that we can eat, but dogs cannot. In addition, there are tons of plants, household objects, and chemicals that can result in poisoning or toxicity, causing your dog to throw up. Some of these items are more dangerous than others, so it's important to keep an eye on other symptoms and get your pet to the vet or animal hospital ASAP. I've written about things that are poisonous to dogs to help you determine the cause of your pet's illness. Digestive Obstruction or Blockage — Your dog could have eaten something that is obstructing or completely blocking off a portion of its digestive tract or even esophagus (which probably won't result in vomiting, but in dry heaving). If your dog is throwing up clear or yellowish frothy bile, there is a chance that this was caused by something your dog ate that is now lodged in its gut somewhere. The vomiting is the body's way of trying to expel whatever it is that is stuck. Obviously, veterinary intervention is needed in these cases. Stomach Issues — Other issues can cause the frothy bile throw up, including gastritis, pancreatitis, or peritonitis. 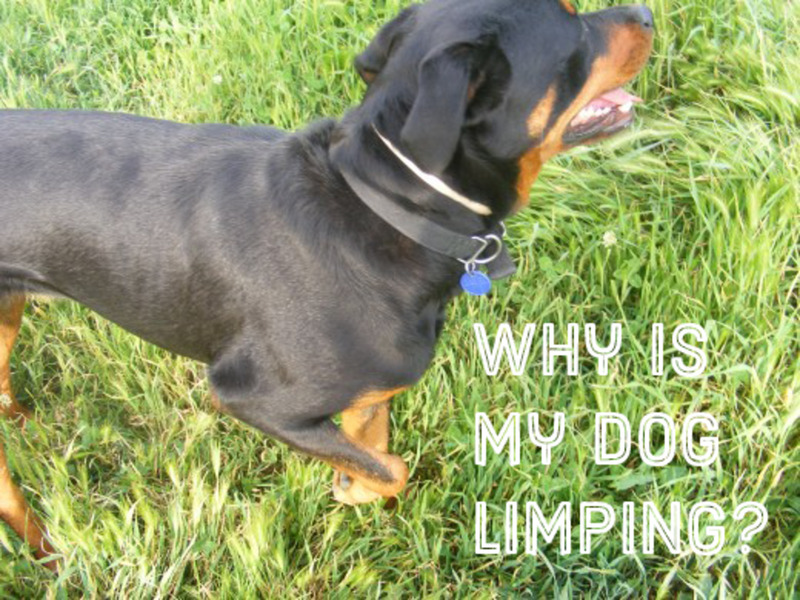 Dogs afflicted these conditions need to be seen by a vet. 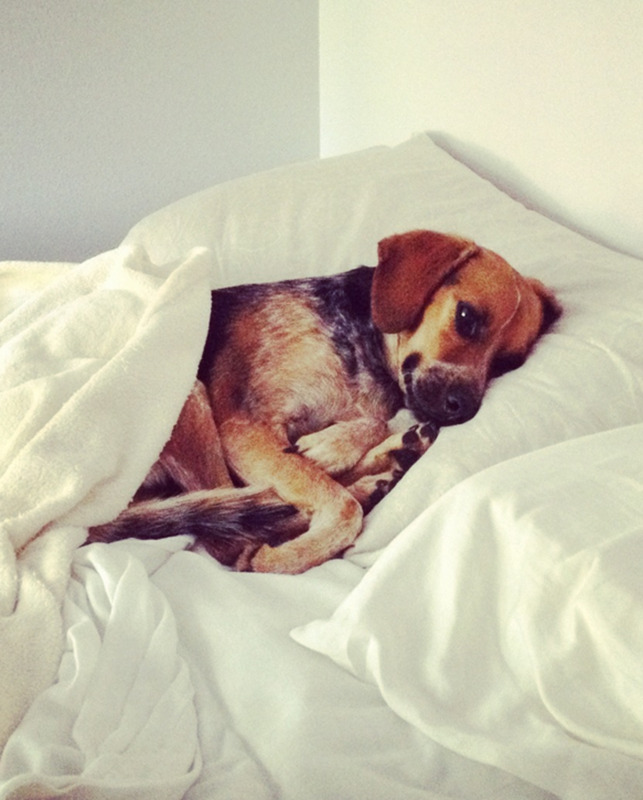 An Empty Stomach — If your dog is throwing up the frothy bile at night or in the morning and isn't displaying any other symptoms, there is a chance it is because the poor thing is starving. Well, maybe not starving, but it certainly could be hungry. Try feeding a tiny portion of food or a few treats before bed. 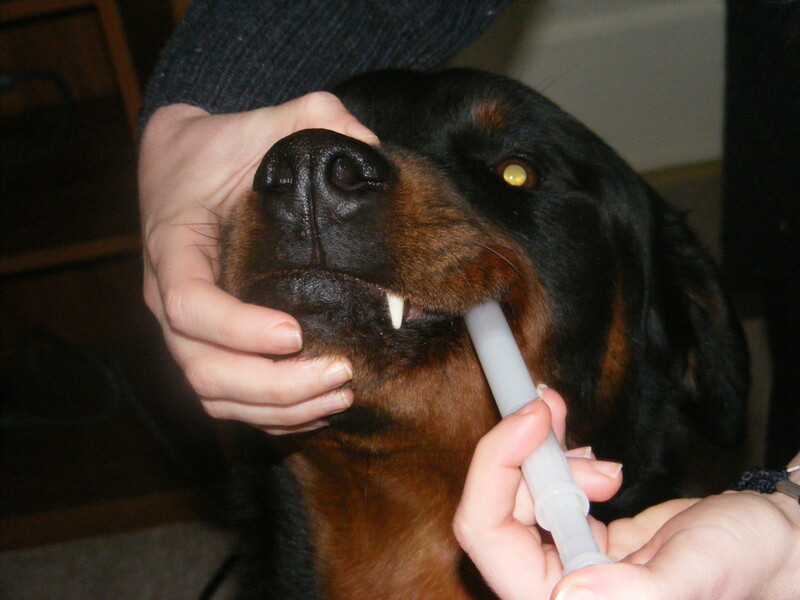 I've gotten into the habit of feeding my dog one of those dental cleaning sticks before bed each night. Motion Sickness — Aw. Dogs can get carsick! If your dog is throwing up only in the car or on a boat or something, there is a good chance it's got doggy motion sickness. Behavioral Issues — Your dog might be stressed out, eating too fast, or eating then exercising too vigorously. Are you picturing a dog with sweat bands on, running on its hind legs on a treadmill? 'Cause I am. Bloat — If your dog is trying to throw up, but nothing is coming out, there is a chance he/she has a condition called bloat (aka gastric dilatation and volvulus, or GDV). Bloat is a general term that refers to gas build-up in the stomach in cases where the stomach is also twisted (gastric torsion). It is a very dangerous condition most common in larger, deep-chested dogs (from Great Danes to Basset Hounds) and requires a vet's care. Other Serious Conditions and Illnesses — This list is not comprehensive, but the following serious illnesses and conditions can cause vomiting: kidney/liver problems, ulcers, enterocolitis, parvo, distemper, diabetes, and cancer. My Dog is Vomiting, What Do I DO? If your dog has thrown up once, doesn't seem to be experiencing any other discomfort, and isn't displaying any other symptoms, there are steps you can take to ease their stomach. If you are unsure about anything, call your vet for advice. In general, whenever Penny throws up but is otherwise asymptomatic, I put her immediately on a bland diet of plain white rice and boiled chicken. I've also substituted rice for peeled boiled potato. You also want to make sure that your dog is well hydrated, as vomiting can cause dehydration. If you're having problems getting him/her to drink water, try ice cubes. 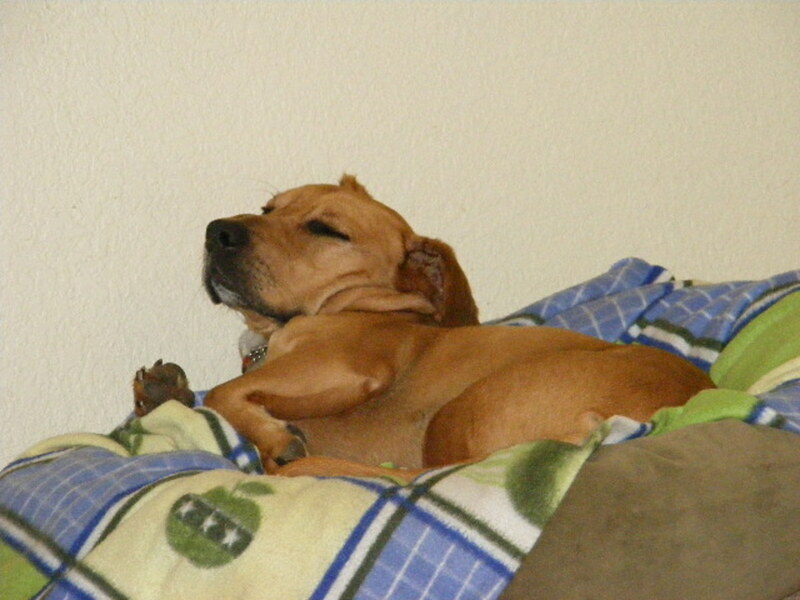 Don't force your dog to eat and try to make it comfortable while its tummy is recovering. Also be sure to clean up the vomit immediately, as just about every dog I've ever met loves to chow down on its own barf. Gross. If nothing is working or if your dog is refusing food, you should take your dog to get checked out at the vet to make sure there isn't a major underlying problem. As always, when in doubt, see a vet. If there's a serious medical condition, reading articles like this or others like it won't cure your dog. Likewise, reading stuff on the Internet is not going to definitively diagnosis a major illness. In addition to testing and treatments, your vet may be able to prescribe anti-nausea medications to ease your pet's discomfort. Diarrhea or other irregular dog poops. Vomit that has something unusual in it, like blood (it may appear red or look like coffee grounds which is actually digested blood), worms, or pennies (US pennies contain zinc, which is extremely toxic to dogs and people). Lethargy (an overall tiredness or lack of energy). Ongoing or continuous vomiting, or vomiting that goes on for more than one day. Vomiting despite the fact that your dog hasn't eaten recently. Bloating in the stomach or abdominal area. My dog is throwing up blood, should I take him to a vet? Absolutely. Go to the vet. Why does my dog only vomit in his crate? The vomit is clear. Can even short exposure to heat cause my dog to throw up everything he eats or drinks? Dogs can get heat stroke, so I suppose it's possible if it's hot enough. Definitely ask your vet if you're concerned. Can a dog get sick from something tie-dyed? My dogs been throwing up something that looks like tie-dye/paint. There's no way for me to answer with certainty, but if I were to guess, I'd say your dog ate something with a lot of pigment, like cookies/cake with colored decorations, or makeup. 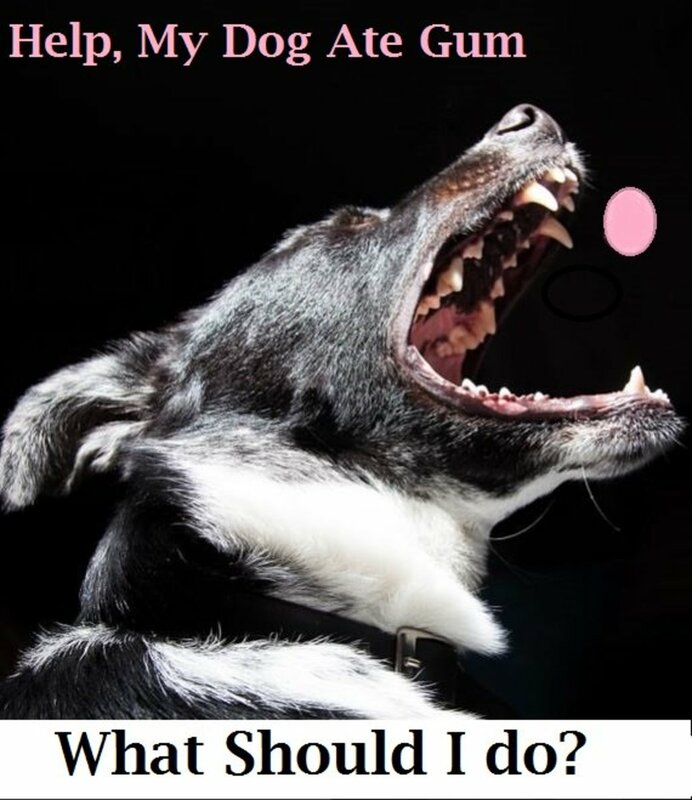 If your dog is not behaving or eating normally, speak to your vet. Comments: Thanks for stopping by, friends. Let's talk about vomit. @babs your dog could have a food allergy. My rescue lab/grayhound is extremely allergic to normal dog food. She was throwing up bile for a few weeks until we switched her to a grain free dog food and she hasn't done it since. Something to think about! Good luck. @Deborah hart -- It sounds like your dog is drinking water too fast. An elevated bowl or a floater bowl may help. @Saihty -- Another reader wrote to me to suggest that the reason for the behavior is that your dog is grieving the loss of their previous owner. It sound like you are doing everything you can to make them feel better. Best of luck! My dog will throw up of she cant get outside to poop.why? I don't know what to do because I just got my dog from the humane society because her owner died and she won't eat ANYTHING. And she keeps on throwing up so I took into the vet, and they gave her a paste that gives her the nutrients she needs but, a few hours after that she threw up. I have no clue what to do, please help me. OK so my dog had this problem and here was his problem. He was not digesting his food. When he ate he practically inhaled his food. He at fast and did not chew it. To remedy this, we now put his food in a coffee grinder and then feed it to him. The problem stopped immediately and has not returned in almost a year. We did not have a coffee grinder initally so we used a hammer and broke it up which was not easy and tried that until we got a coffee grinder. Sadly, I took him to the vet first and spent $200 to find out nothing was wrong with him before I figured this out. I hope this helps! Our rescued Shiba Inu throws up every night /morning a yellow stomach bile , and I’ve tried everything people tell us! I feed him 8:00am and 5:00pm. We’ve tried the half of cup of food at night before bed & again very early morning 5:30am he also tried different foods, but still happens! My other dog is on a diet, so I feel bad because I’m not giving him all the treats and snacks our other dog is getting . @Kathy jannone In general, when it comes to the health of anyone's pet that's not my own, I'm always going to recommend that a professional be called. 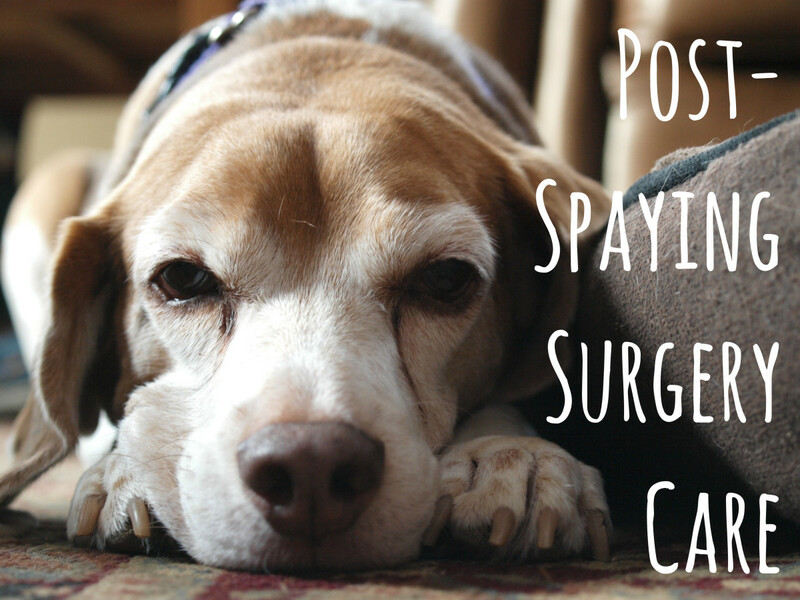 Call your vet and they can help you determine how serious it is and whether there are other symptoms present. My min pin 8 yrs, with slight allergy problems, threw up to nite within 10 mins, 8 piles large approx 5-6" in diameter. That looked like un-digested food or poop looking logs but no smell. I can't find my there motel to take his temp. What should I do? Watch him or what? My friend told me that if u pick up a puppy that has tapeworm u could get it to if u pick up the puppy after it vomit on the bed and put it down off the bed. Is that true? I'm not sure what's wrong with my dog. She gets plenty of excercise. Eats healthy, food shows no sign of spoilage (food kept inside). At random moments especially after eating she will cuddle up to me or my girlfriend and vomit right in our laps. The dogs nose is still wet. I make sure she has plenty of water. If I catch what she is about to do and remove her she won't vomit. Is it stress, diet, etc....? She's my furry baby, plz help. @kane I'm not a vet, but I've never heard of a connection between ice and renal health. I do know hydration is very important for kidney function, so it's possible feeding a dog ONLY ice could be a problem because they might not get enough water and could become dehydrated. Based on what I've read, if a dog is not drinking anything because they are sick, crushed ice is a better than nothing. My dog only really throws up when he drinks too much water really fast he drinks a whole bowl then does the smile and puffs his cheeks then i run him outside, i got told by my vet not to give him ice because it can cause kidney failure. Two things that can turn everything around 1) Slow feeder bowl and 2) Natural dog food, low in Corn, Wheat or Soy Proteins (or none at all). Our Min Pin started vomiting everything at about two years, he was a rescue dog and we adopted him at 9 months. He had no problems with eating whatsoever but for some reason after the first (and only) time we boarded him at our vet he developed "problems". At first it was once a day where he would throw up food, sometime just bile, then it became anytime he ate. Vet ran some tests and gave us medication for him. When that didn't resolve the issue they wanted to do more tests including ultrasound. We had been feeding him what I though was good quality food (Eukanuba) but I decided to do some research of my own into why dogs vomit. I came across the benefits of a slow feeder bowl, how it mimics the way dogs in the wild would eat as they would take their time feeding on a carcass, not scarfing a bowl of food down in 2 minutes. We bought him a nice round slow feeder that looks like a maze and it takes him about 1/2 hour to finish 1 cup of food. I also found a brand of food that is low in fillers dogs cannot easily digest: Blue Buffalo. They make a Rocky Mountain Recipe for small breeds and he loves it. Now the only time he loses his lunch is when he decides to eat something that's not actually food (hello Spring!) but we're working on that. I have an 11 yr old west highland. Just about every morning he vomits up white milky fluid. Like an old man cough mucus. Once he coughs it up he's fine. Not a lot but seems to happen more in the colder weather. Vet didn't seem concerned but why does he do this?? Why on earth would you store your dog food outside?? Our Labradoodle has a crazy strong gag reflex which results in his whole body convulsing in the throwing up. Should he being looked at? I know this is an older article but here' hoping: anyone ever heard/seen their dog puke up a weird fleshy round chunk? It almost looks like a tumor or something but it's shiny, smooth and reddish and is about the size of a golfball (no we don't have golf balls lying around). It's definitely organic matter, and idiot think it's from a rat or anything he could've eaten. It's so weird! If it happens one more time I'm gonna take him to a vet. My dog keeps throwing up and it has a yellow color he is not eating and not moving around a lot he looks like he hasn't eaten he also hasn't pooped or peed in the last 24 hr and idk what to do????? My husband was able to get a trash can under the dog last week. He was really proud of himself. I've never had to deal with much hassle on the other end. Holy cow that sound terrible. Oh, how we all know that horrible hacking/retching sounds that give you just enough time to throw something under them to catch the vomit. I gave up a long time ago trying to get the outside or on hard floors when I heard that. Another fun one to watch out for is the runs, we had a bout of it during my finals week a few years ago. Nothing like missing finals to take a dog out every 10-20 minutes with brown water spewing from the back end. Not even slightly solid, just pure liquid. I'm glad she survived it, but it wasn't fun for a few days. The vet said as long as she was drinking water and eating plain food, it should clear up in a day or two. I thought it was never going to end. Ha, my lil silky terrier just threw up the leftovers from last night!!! I didn't know that vomit looking like coffee grounds is digested blood. That is a side effect warning on my anti-depressant... kind of scary! Great lense, check mine out about grooming. I'm new to squidoo. Great lens! My Buffy throws up Puppy Chow, but not Puppy Beneful. No more Puppy Chow for her. Had cats for 30 years. Taffy, AKA Princess Barf Her Guts, always threw up at precisely 4 AM. Doggy barf is so less frequent. Our dachshund often throws up after eating his breakfast, but almost never after eating his dinner, which is the same food. Any ideas? @dozersmomma: It may be a food allergy. Try putting your dog on a homemade diet. It has worked wonders for me. Small meals several times a day may help also. Thanks for the article, very useful. 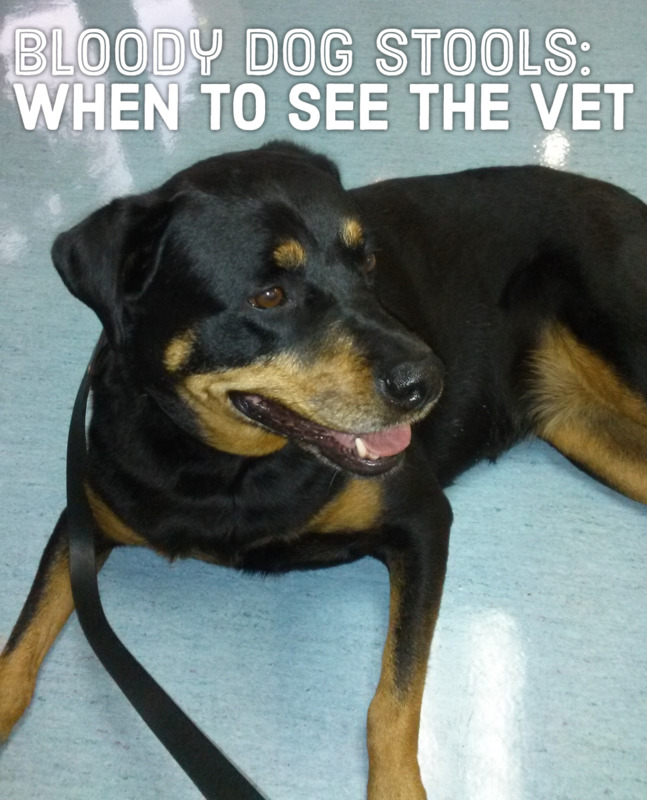 I have a 9 year old rottweiler, who has steadly been going to vet now 3-different vets since Dec 2013 for vomiting. He has been on every diet imaginable, been on anti vomiting med's, have had to hospitilized for dehydration, even have ultra sound scopes down.... and the vet still hasn't been able to give me any type of answer on what the cause is. If any of you have a suggestion, please please please contact me... I am getting desprite at this point. Our most recent vet adventure, we were told that we are running out of options and need to start considering what's best for his quality of life. I am not ready to give up on him, he acts normal, eats and drinks normal, just can't keep anything down. He is generally a happy boy. Great article and a lot of important information for dog owners, Shay Marie! A lifetime of owning dogs and their dry kibble and I never knew it would go bad. Enjoyed your writing style too. Very entertaining while you educate us! Really appreciate the info! Some great basic dog owner information. Enjoyed the photos. Great lens with awesome information! Had no idea dry dog food could go bad like that either. We have always kept LolaBelle's in the garage, but will be more aware of this potential problem during the hotter months. My LolaBelle vomits when she is stressed out. It is so random and she looks so pitiful afterwards. Poor babies!!! Very useful information. Thanks for these doggy tips and knowledge. Fun way to tackle a subject that affects a lot of loving pet owers. My last dog used the barf as a puppy. You'd find him sulking around it with a guilty look on his face. I'd tell him he couldn't help it and it wasn't his fault. Our tummy's get sick sometime, I'd say. Of course, he didn't understand, but I hope I was comforting to him as a spoke. Great lens! My dog throws up usually after eating grass! Our dog used to vomit a lot as well, but has seemed to have grown out of it. @syerodriguez: Changing people's views on dog vomit is a personal goal of mine. I'm glad you enjoyed it! 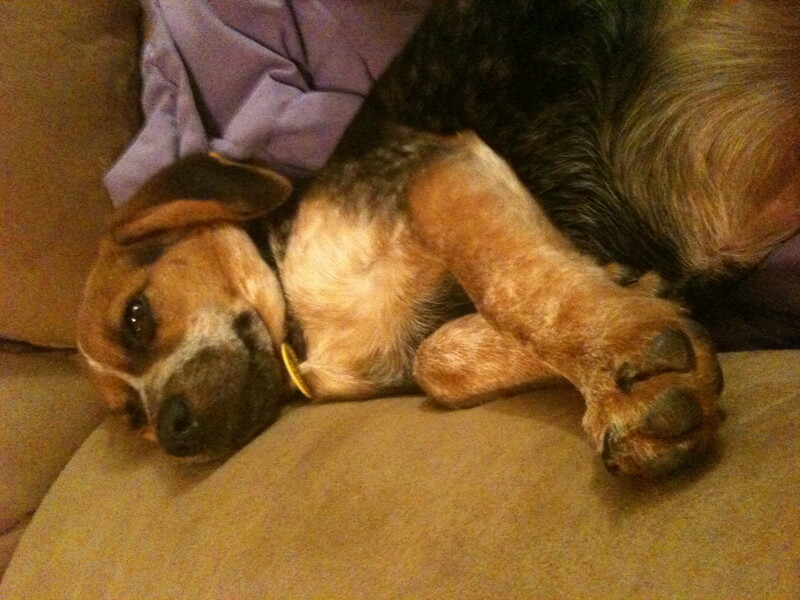 @Erin Mellor: I just pulled some kind of fruit pit or plant seed out of my dog's mouth that she had found in the yard. They will eat anything. I'm dogless at the moment, but this is really useful. My dog used to barf up random things he'd eaten in the park, but still he kept eating them (and he'd eat his vomit if given the chance). 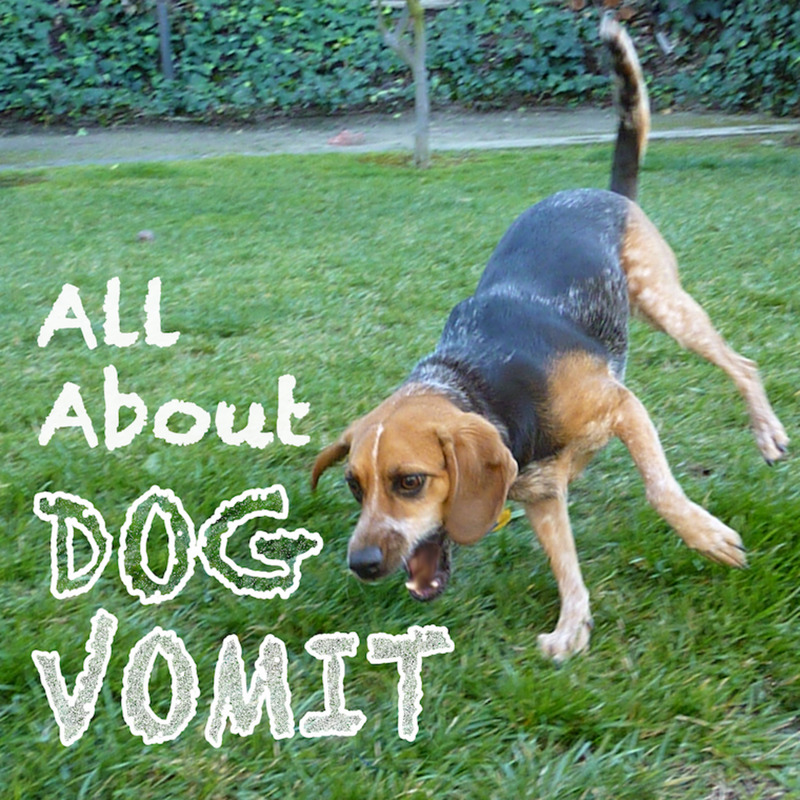 I really liked this article, this will be very helpful to prevent my dog from vomiting.